Eggemeyer’s General Store, along with the surrounding buildings in San Angelo’s historic district, was originally designed by architect Oscar Ruffini (1858–1957). 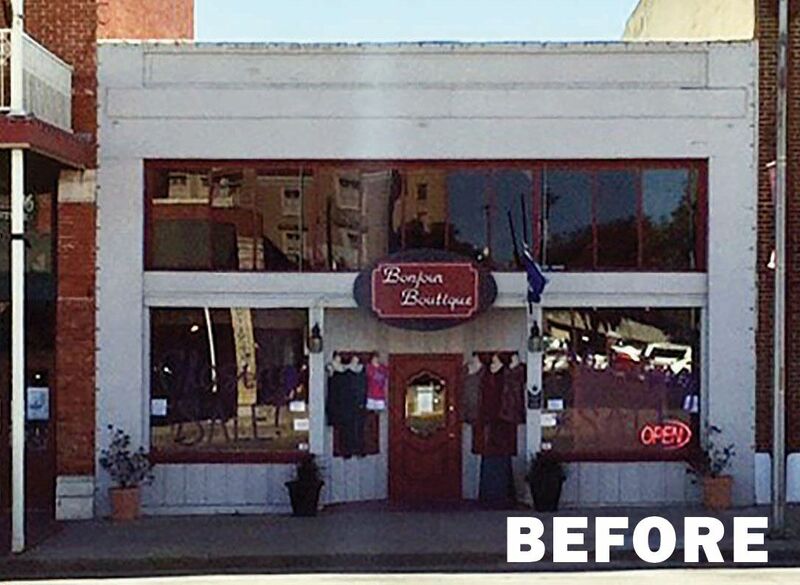 Providing continuity was a main factor for the owner’s interest in choosing limestone from a nearby quarry for renovating the storefront. Many elements of Ruffini’s original designs were incorporated into the final design of this project to capture the architectural antecedents that helped define the culture and design within the area. Another factor for choosing limestone was to serve as a reminder of the importance of staying true to heritage, and to encourage more use of locally-sourced material. 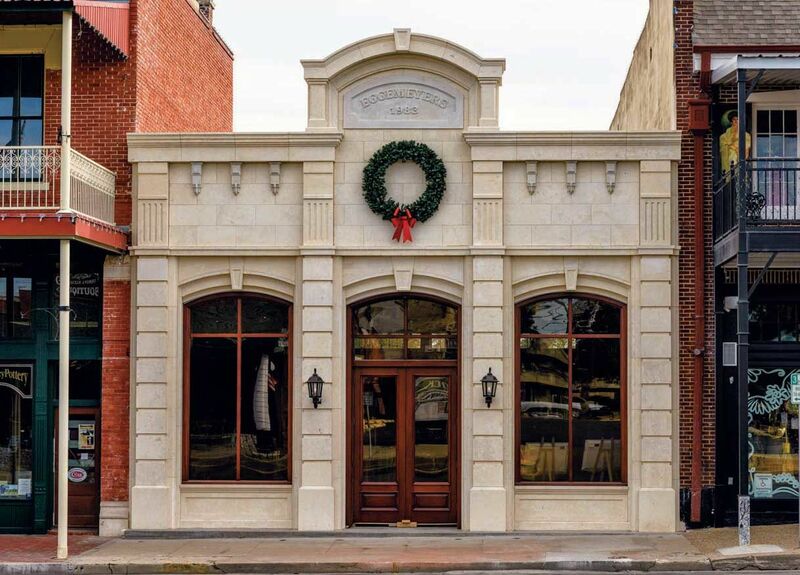 The entire façade was clad with rich, cream-colored Cedar Hill Cream limestone from TexaStone Quarries. Every element was hand-crafted, from the base stones to the arched cornice containing the largest pieces weighing 3,000 lbs. each. These allowed the design to appear grand in stature, but not overpower the constraints of the façade. Other elements were fabricated in sections. Large panels above the doors and windows completed the openings, and the limestone transitioned to a band where the original masonry existed. 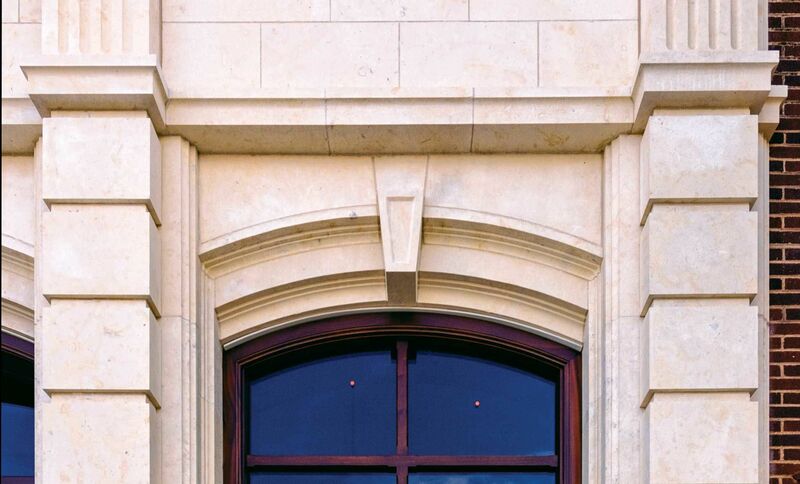 Limestone panel veneer completes the façade between the corbels and up to the center cornice arch. The project presented its own unique challenges with designing around an existing structure. The success was based on the skilled masons and their craftsmanship and the professional relationships that were developed over time. The completed design provides continuity within the historic district and will easily tie-in with future projects. The Provo Tabernacle was originally built in 1882 and has been a center for the community’s activities for the last 100 years. In the early morning of Dec. 17, 2010, a misplaced electrical light started a fire in the attic which completely destroyed the building except for the exterior masonry walls. 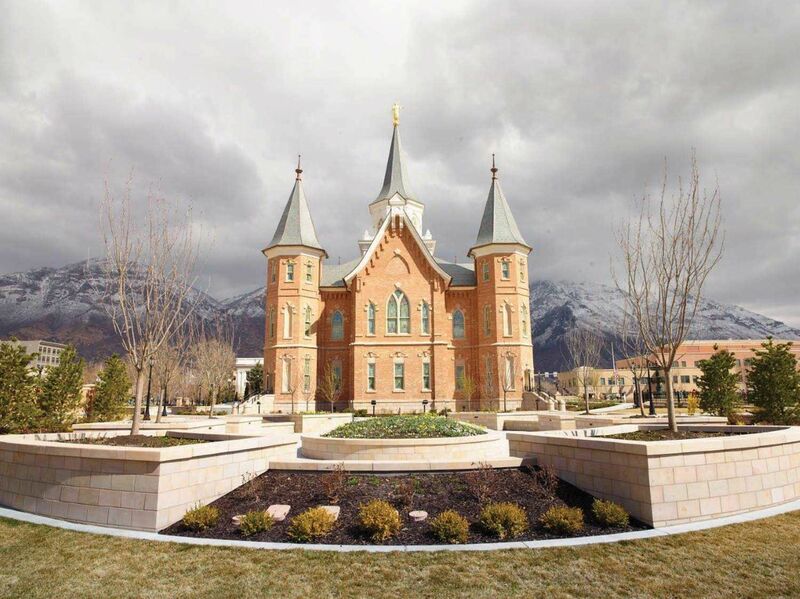 After working through a preliminary design at the October 2011 LDS General Conference, then-President Thomas S. Monson of the Church of Jesus Christ of Latter-day Saints, announced that the tabernacle would transition to the Provo City Center Temple. The design then began in earnest and required 14 months to complete. Construction for the project took approximately four years and eight months. The building was dedicated on March 20, 2016. In order to transform the tabernacle to a temple, a majority of the temple support spaces had to be located in the basement and under the north plaza. This would require excavating down 40 feet below the building with the help of 411 micropiles. 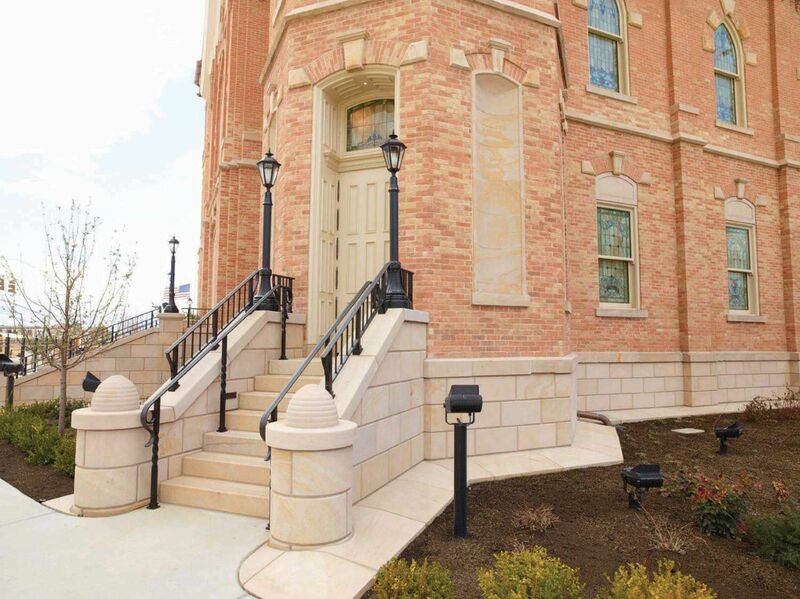 To create the design vocabulary for the building, historic details were used from the original Provo Tabernacle and other inspiration came from the Victorian design movements of Eastlake and High Gothic Revival. Most of the exterior of the shell and some of the original stone was able to be salvaged and reused. 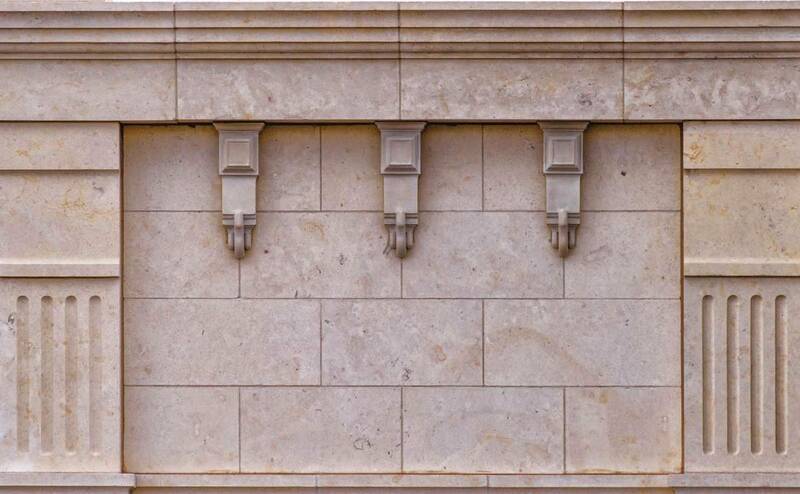 In an effort to match the historic look of the structure and its existing material, and because of the dense and durable nature of the stone, Mountain Valley quartzitic sandstone was selected. This was used to replace damaged stone accents and to create new accents and landscape elements. 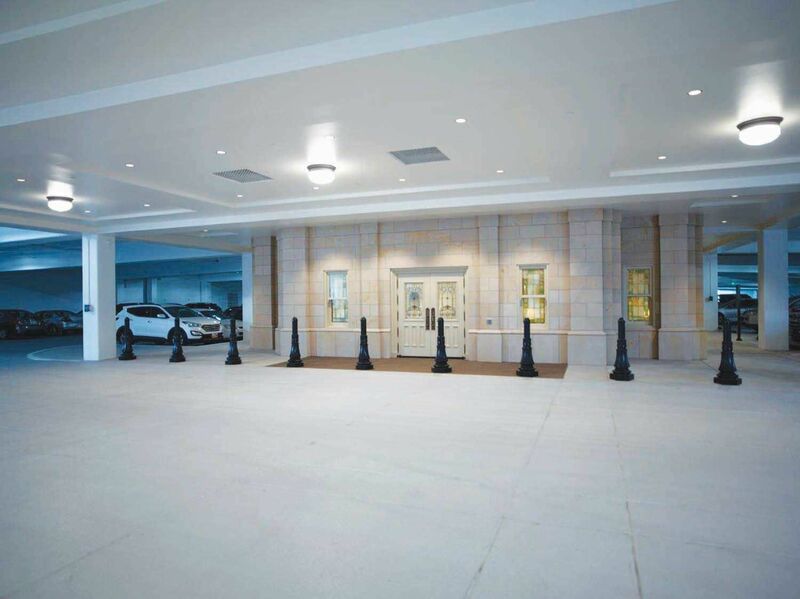 This stone was also used extensively throughout the new underground parking structure.